Although he’d spent a lot of time in the mountains skiing, it never occurred to Alex Pancoe to actually climb one until a trip to Africa inspired him to try Kilimanjaro. Thinking he’d bitten off more than he could chew, he trained as hard as he could and surprised himself by taking it in his stride…and so decided to climb more. Kili is one of the Seven Summits – the high point of each continent – and pretty soon Alex decided to try to do them all. Now, back in his late teens, Alex had started to have headaches. Bad headaches. They grew gradually worse until eventually, at his Mum’s bidding, he went for an MRI and discovered he had a brain tumour. Fortunately, it was benign and was successfully removed, but he knew how much worse it could have been and how a great many people were not so lucky. So, he decided his Seven Summits would not just be climbed for his own sense of achievement: he set out to raise $1,000,000 for the Paediatric Neurosurgery division at Chicago’s Lurie Children’s Hospital, where his tumour had been removed. We were stuck at high camp in some gnarly weather for 4 nights with temps approaching negative 50 with windchill! The whole suit came in handy then. He’d left his iPad lower down the mountain so had nothing to keep him occupied, but the rather more pressing problem was the food: expecting to reach the summit, the team hadn’t brought enough for their unexpected stay. As supplies dwindled, they were very fortunate to be able to keep themselves going with a decades-old stash of salami and smoked salmon they’d happened across. 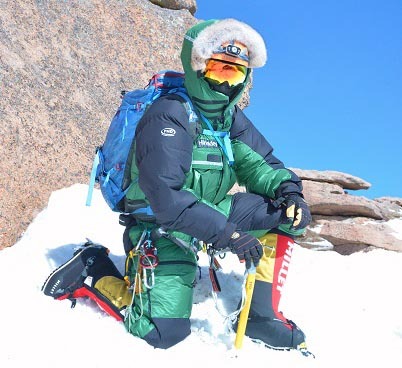 The weather lifted though, and their wait was rewarded with great conditions for the summit – so much so that he was fine in just the -10°C rated inner suit: something you couldn’t do with a single layer of insulation. …I just went with the first layer. Worked well. One thing I loved is the suits are designed in a way with pockets etc. that you can get creative with your systems. So I actually put a hot Nalgene in my front pocket and could use it to warm my hands if they got a bit chilled. Versatility: that was always the idea! It’s good to hear how our developments are put to use out in the field though. 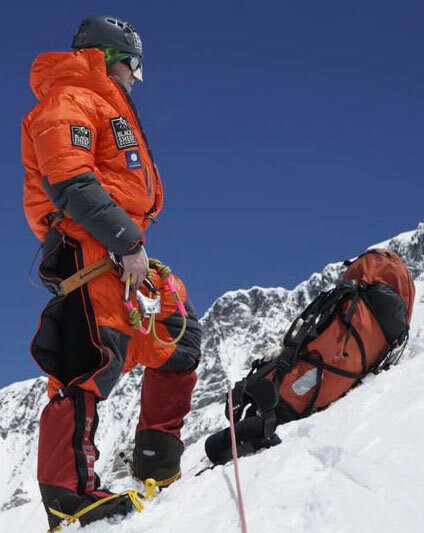 We designed the suit for the big peaks of the Himalayas – where you get hot lower down and cold higher up – but of course, that ability to play with your layering is useful anywhere there’s a wide range of conditions, as Alex found when he became the first person to wear a Double Suit on the highest point of Antarctica. Indonesia’s Carstensz Pyramid is next in his sights, then skiing to the North Pole in the spring, and…well, if you want to keep track of what Alex is up to next – or make a donation to his cause – you can check out his blog at peaksofmind.com, or follow @AlexanderPancoe on Twitter. So light it’s just not fair! 160km – 100 miles, if you prefer – in under a week is quite an undertaking. Even more so when you do it at altitude. Even more so when you consider that the height gain is upwards of 28,000m. To put it in terms of the mountain which serves as your backdrop, that’s going from sea level to the summit of Everest more than three times over, in just six days. Your kit is AMAZING !! Wow - very impressed. I’m a really cold person but even on my own in a tent at -8°C I was comfortably warm. It’s also incredibly light. So light, the organisers made me take extra items to MAKE UP weight in my bag! The race itself was rather hard but fantastic. 4th lady and 17th overall so pleased with my first mountainous multi stage event attempt. I think I’ll go back next year. As well as the Ultra Jacket she’s wearing in the picture, she took a Minim 400 K sleeping bag, Minimus Trousers, and Wafer Socks. 4th place on her first attempt: a very impressive achievement, we’re sure you’ll agree. Congratulations Rebecca, and best of luck next year! There are many things people choose to do in order to push themselves: running marathons, running ultra-marathons…and then there’s the Fire & Ice. Said to be one of the toughest races in the world (even the five-times winner of the Marathon des Sables reckons it’s tough), it takes in 250km of volcanic ash, glacial river crossings, barren rock, grassy meadows, and everything else the Icelandic terrain can possibly throw at you. 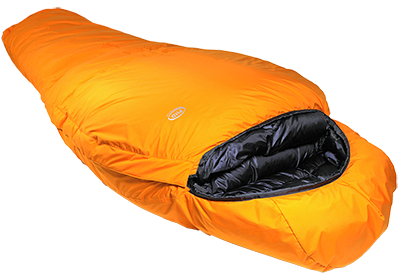 Last year, it was won by Canada’s Charles Miron, who took a Wafer Jacket and a Minim Ultra Sleeping Bag with him. He’s had the bag for a few years – it’s accompanied him to numerous race victories and course records – and now it seems he’s pretty fond of the jacket too. So, when he began coaching Greg Soltys and Whitney Titheridge for this year’s Fire & Ice, Charles pointed them in our direction for their kit too. Whitney took our Ultra-K Jacket and used our Design-Your-Own tool to create a Lightweight Bag, customised to her own specifications. Greg chose a Wafer Jacket, Trousers and Socks, Mera Mitts, a Sigma Vest and a K-Series Minim 400 Sleeping Bag. Huge congratulations from all of us here at PHD to Charles, Whitney and Greg for their very impressive achievements. We were approached, a little while ago, by a chap called Will Rowland, who wanted to talk about sleeping bags. Nothing too unusual in that: as you might imagine, people ask us about sleeping bags pretty much every day! This stuck in our minds though, thanks to an old family connection. Decades ago, when Pete Hutchinson Designs was still simply Pete Hutchinson and his designs, Pete made a sleeping bag for Clive Rowland, an accomplished mountaineer who’s known for (among many other things) saving the lives of the seriously injured Doug Scott and Chris Bonington on the Ogre in 1977. Will, as it turns out, is Clive’s son, and figured that if it was good enough for his Dad, it was good enough for him. He wanted to chat about sleeping bags as he was one of a team who were heading to Kyrgyzstan, looking for unclimbed peaks. It may seem that there is nowhere new left to explore: everywhere’s been visited and every mountain climbed, surely? Well, not quite. There are still a few regions hidden away, where climbers’ eyes light up at the prospect of being the first to set foot on a new summit. In August 2016, the remote Kyrgyz range of the Djenghi-Djer was visited for the first time by a climbing expedition; they put up a number of first-ascents, and noted that there were many more for future teams to explore. And that’s exactly what Will and his friends had decided to do. After few conversations about what they’d need (and what they may be likely to need for future trips), the team decided on Hispar 500 and 600 bags. One of the 500s was shelled in waterproof HS2 fabric, to put up with the sort of cold, wet conditions normally more associated with arctic exploration, so we’ll hopefully have another expedition to keep an eye on in future! For now though, the team look to be having a great time out in the Djenghi-Djer. If you’d like to see what they’re up to, you can check out their blog, and see the latest updates on Facebook. The Seven Summits: the highest peaks on each continent. Fewer than 500 people have climbed all of them and, of those, just 9 British women have managed it. Well, last month, with her success on Denali, Jo Bradshaw came a step closer to being the 10th. Her first came in 2008 with Africa’s highest: Kilimanjaro. South America’s Aconcagua followed at the end of 2011, then came Elbrus, on the eastern fringe of Europe, in the summer of 2015. 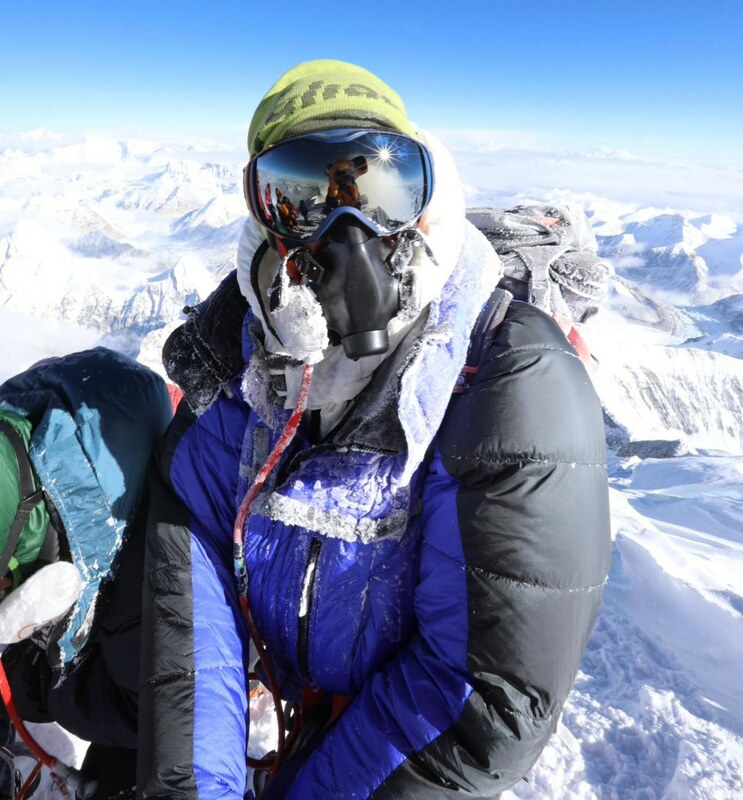 She was at Camp One on Everest when the tragic earthquake struck in April 2015, but she returned a year later to successfully gain the highest point in Asia (and, of course, the world). When this journey began, it wasn’t about the Seven Summits. In fact, to begin with she had no intention of climbing Everest. She was climbing each mountain in its own right…and to an extent of course, she still is. They each present their own unique challenges, they each have their own unique personalities, but now the challenge of the Seven is definitely on! This June, it was North America’s turn, in the shape of Denali, in southern Alaska. A very different beast from Everest. While climbers still need – of course – to be a team, those teams must themselves be more independent: carrying more, hauling loads in pulks, and being prepared to sit and wait out the weather. "…it’s all about the raw nature of the environment and the need for self-sufficiency. No Sherpa support, no teahouses, no Tanzanian crew, no Pablo at Plaza de Mulas cooking incredible meals. It’s you, your teammates and the mountain, brilliant." There was the typical Alaskan mountain frustration to contend with: the “Will we…won’t we…” and the “Oh. Weather. Not today then.” There was also the rather less typical frustration of carrying an extra 5kg canister of what was assumed to be fuel…but which turned out to be full of human waste. And there was of course the constant need for sheer human fitness: all her training with dragging a tyre started to pay dividends. Then, on 20th June – a year, a month and a day after standing on the summit of Everest – she reached the high point of North America. On Everest, her PHD gear “saved her arse” (thanks Jo)…so when she was planning Denali, she got in touch with us again. She was interested in being able to layer up, to make her insulation more versatile, to suit changing conditions and future trips. So, when she set off for the summit, she did so in her Minimus Pullover and Rondoy Trousers, with a Svalbard Jacket to pull on over the top when she stopped: a set up she described as “bomb proof”. Australasia’s Carstenz Pyramid is on the cards for this autumn, then there’s just a little jaunt to 78° south: to Antarctica, and Mount Vinson. And that will be all seven! Don’t let all this give you the impression that she’s ‘only’ climbed 5 mountains though: she’s pretty much constantly climbing, hiking and biking. And when she’s not, she’s helping others do the same, whether it’s leading climbers in the mountains around the world, or assessing D of E groups in the UK. One of the great things about Adele Pennington is that she’ll batter the living daylights out of her gear, then tell you what’s wrong with it. Why’s that so great? Well, if she tells us there’s something wrong, we have an opportunity to make it better. And if she tells us it works, we can be certain we’ve got it right! Adele’s been a lover of climbing and adventure all her life. A serious accident in the Alps may have put her in a wheelchair for several months, but she got fit again and headed back to the mountains. 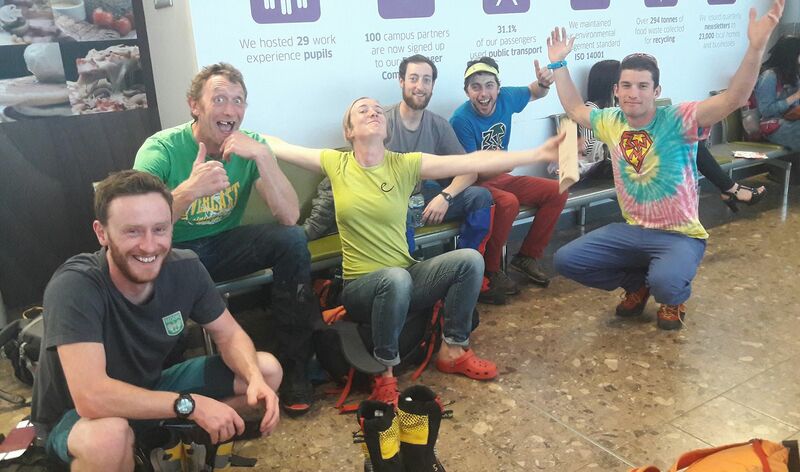 After years of trying to fit climbing harder and higher around work, she realised that actually, it could be work, so she became an instructor and expedition leader. 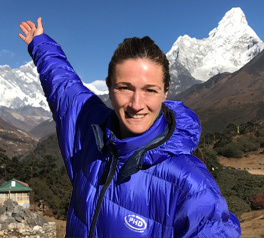 As well as her day job in the Scottish mountains, Adele can boast the first ever winter ascent of Ama Dablam by a British woman, ticking off various Himalayan peaks (including Everest, twice)…and now she’s just returned home after summiting Dhaulagiri. On her first attempt on Dhaulagiri back in 2014, she unfortunately didn’t make the summit. But, as she reflects, “climbing at altitude is a special kind of pleasure that requires hard work and resilience”. This time, having pushed through the homesickness, the fear and the rotten weather, she was able to experience the joy of a summit-day sunrise, of reaching the peak and safely descending, and of breaking the British Women’s record for 8000m ascents. And that record had been hers anyway! So, when Adele tells us “My success and lack of frostbite is undoubtedly due to your high performance equipment”, well, it really means something. Our congratulations go to Adele on her latest achievement, and our continuing thanks to her for really putting the gear through its paces: the real world is the best kit-testing lab there is. When it comes to down suits, Tim Mosedale is something of a connoisseur. After dozens of Himalayan expeditions (including five summits of Everest, two of which in one season) and over 50 previously unclimbed peaks in Greenland, you start to get an idea of what your gear needs to be able to do! One of the projects Tim’s involved with is Mountain Panoramas: taking 360° hi-res photographs from summits all around the world. This means lugging an extra 8kg of gear with him, then stopping for a good 45 minutes to set up and take photos. He’s managed to capture the panorama from Everest’s South Col but unfortunately the cold, challenging conditions meant the summit shot eluded him. However, he reckons that “this suit combo looks like it might have made the difference”. 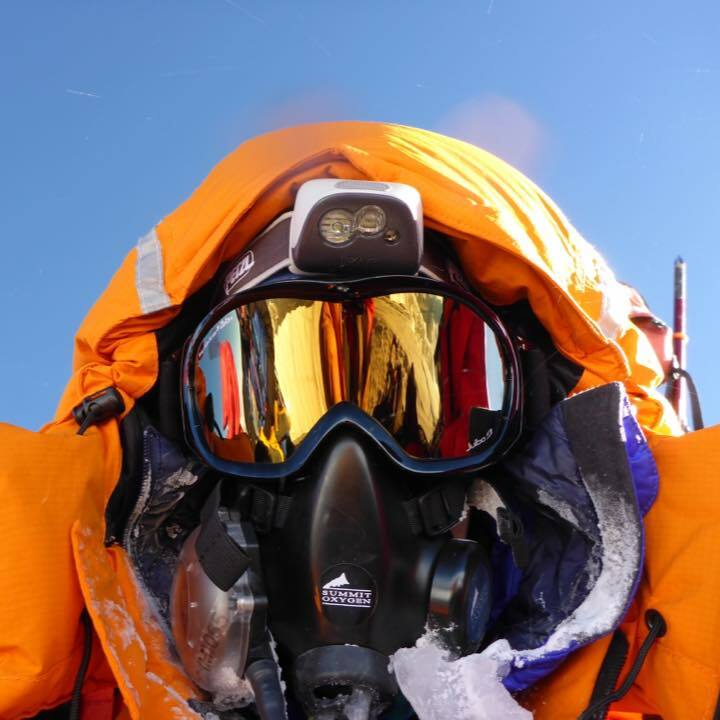 Well, he’s now gone back to Everest to get the first ever gigapixel 360° x 180° sphere from the summit and so, to make sure he stays warm (but can cool off when he needs to) we’ve made him the -50°C version of our Expedition Double Suit. If you want to keep an eye on what Tim’s up to, you can have a look at his Twitter or his website. Update: Congratulations to Tim for summiting Everest on 16 May 2017. Unfortunately the conditions weren't good enough for the Gigapixel project. So for the fourth time Tim has carried an additional 7kg of tripod, panoramic bits and bobs and batteries to the various camps on the hill and up to the summit to no avail! Ultan Coyle is a designer at Rapha, but also a long-distance bikepacking / racing specialist. In 2015, and again in 2016, Ultan was a top ten finisher in The Transcontinental, a self-supported, ultra-distance cycling race across Europe of around 4,000km. Ultan is returning again in 2017 for a tilt at the win. In preparation Ultan has been riding the Altravesur, a challenging bike-packing route that crosses southern Spain from Cadiz in the west to Valencia on the Mediterranean coast. The Altravesur covers 834 miles, 85% unpaved, and has 26,822m of ascent. To keep his bike as light as possible on the Altravesur, Ultan took a PHD Sleep System. 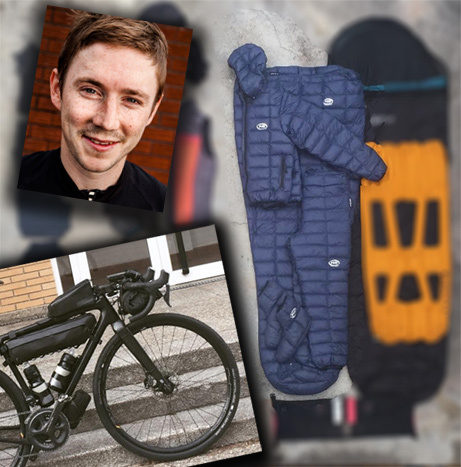 The system comprised Wafer Jacket, Socks, Trousers, and a Filler Down Sleeping bag, all packed down into the handlebar bag. Used together the system has a night-time temperature rating of 10°C. And, of course, the Jacket is a useful piece of kit all day long, and the Trousers and Socks, are great in camp. You can follow Ultan on Instagram. 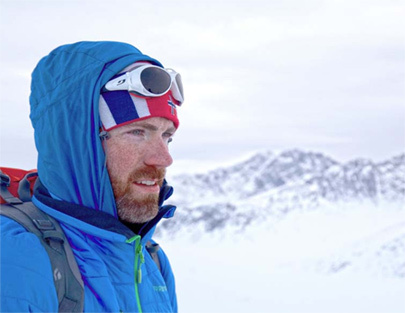 In 2016 Luke Robertson became the youngest Brit, the first Scot, one of less than 20 people in history and the first person with an artificial pacemaker to complete a full length 730 mile solo, unsupported and unassisted ski to the South Pole. 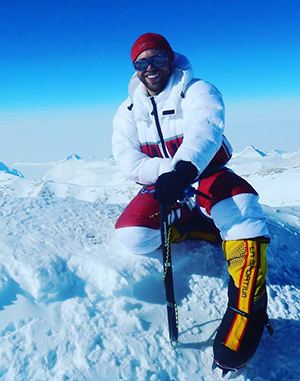 This achievement was all the more remarkable because Luke had come through life-saving brain surgery less than two years prior to reaching the pole. In May 2017 - shortly after running the Marathon des Sables in the Sahara Desert – Luke and his wife Hazel are embarking on a world-first expedition to Alaska, where they hope to become the first people in history to travel the full length of Alaska by human power. 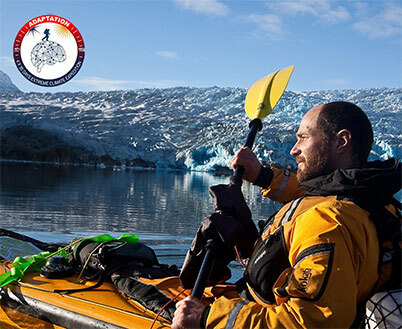 'Due North Alaska' will take 80 days and cover over 2000 miles, including a combined 700 mile kayak, a 600 mile cycle and a 700 mile run. Beginning at the Pacific Ocean, Luke and Hazel will travel through temperate rainforest and the glaciers & mountains of South Alaska, through the boreal forest and tundra desert and high above the Arctic circle, before travelling along the open the Arctic Ocean. Follow Luke’s latest adventure on his website. Incurable cancer and polar expeditions: not traditionally the most comfortable of bedfellows. Back in April 2015, Chris Harrop was intending to ski to the North Pole. However, his pre-trip medical turned up a diagnosis of chronic myeloid leukaemia: a form of cancer which affects the bone marrow’s production of white blood cells. He began chemotherapy, and will now need to continue treatment for the rest of his life. Well, it seems he’s going a little beyond that. This April sees Chris flying to the North Pole, which by most people’s reckoning is not the way to lead a reasonably normal life, and on chemo it’s certainly not to be sniffed at! His treatment means he really feels the cold, so as temperatures dip below -40°C, there’s no cutting corners with cold weather gear. To that end, he’ll be wearing our Xero Down Jacket, Trousers and Mitts, and under that he’ll have a Taiga Pullover, Trousers and Mitts. As well as realising his ambition of visiting the top of the world, Chris is taking the opportunity to raise money for a cause which is – quite literally – very close to his heart: the funds raised will all go to the charity Leukaemia CARE. Take a look at Chris’s Twitter (@Marshalls_Chris) to see how he got on and, if you fancy donating, you can visit his JustGiving page. Fortunately Ciaran was not seriously injured. However, Lakpa Thindu Sherpa died in the avalanche. Our thoughts are with his family. 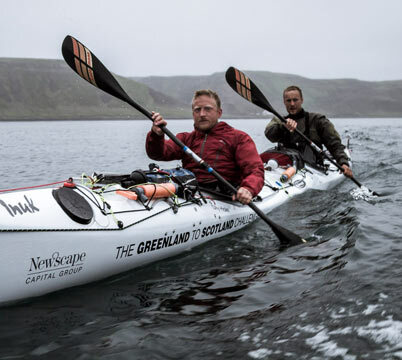 Inspired by stories of Inuit hunters who paddled from Greenland to the Orkneys in the 1700s, Olly Hicks and George Bullard decided to try the extraordinary journey themselves. They left Greenland on July 1st and landed in Iceland before crossing difficult open water to the Faroes, a stretch they called the Devil’s Dance Floor. From there they kayaked to the Scottish island of North Rona, and after 66 days arrived at Balnakeil Bay near Durness in Sutherland. They had paddled 1,200 miles. The Guardian listed their expedition as "one of the most inspiring adventures of 2016". Olly's PHD Minimus Down Sleeping Bag went along for the ride and, Olly says, "did the job very well. Recommended!" You can find out more about their trip on Olly's website, and follow the progess of his attempt to make the first solo row around the world beginning in early 2017. Christian Clot is a French-Swiss explorer known for his expeditions of Patagonia and the Cordillera Darwin mountain range in the Tierra del Fuego. In 2016 Christian began a new expedition: ‘Adaptation’, which will involve the crossings of the four most extreme environments on the planet to better study the adaptability of the human body. The environments are: the hot, dry desert in Iran; hot, wet Amazonia; cold, dry Siberia; and cold, wet Patagonia. 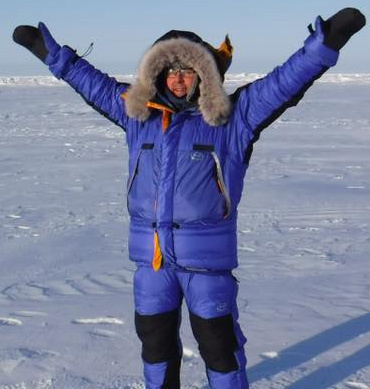 We delighted that Christian has chosen PHD to supply him with the kit for the Siberian leg of his expedition. We’re supplying him with a K Series Hispar 1200 sleeping bag; Omega down Jacket, Salopettes, Mitts and Socks; Polar Mitts; Wafer Socks; and an Extreme Balaclava. You can find out more about Christian’s expedition on his website and via his Twitter account. There are even opportunities to take part. The BBC's Planet Earth II has got off to a fantastic start. The second episode, 'Mountains', provides unique and intimate glimpses into the secretive lives of mountain dwelling animals. Filming an eagle's eye view over the Alps proved a challenge for the paragliders, so photographer and film-maker Jon Griffith got a call. Flying tandem (and for the first time) Jon captured some superb footage in his desent from the Aiguille du Midi. 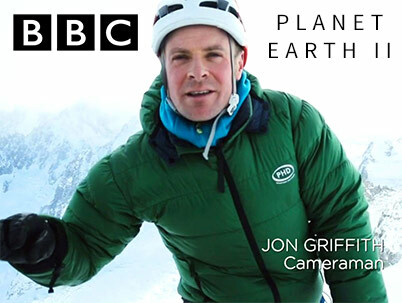 The eagle-eyed of you may have spotted that Jon kept warm in a PHD Yukon Down Jacket. Jon's used the Yukon before. During a one day ascent of the Bonatti Vaucher on the Jorasses north face Jon told us that "I was leading really thrutching pitches in the dark late at night and was sure I would have ripped it to shreds, but not a scratch." 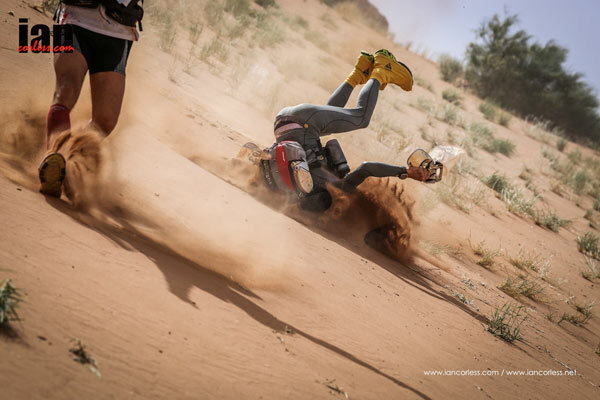 The jacket's robustness came in handy during the shoot: Jon had a rather bumpy landing. See for yourself on BBC iPlayer. The Iditarod Trail Invitational is the world's longest winter ultra marathon and follows the historic Iditarod Trail from Knik, Alaska over the Alaska Range to McGrath and to Nome. Competitors can race on fat bike, foot or skis. The ‘short’ 350 mile race finishes in the interior village of McGrath on the Kuskokwim River and the 1000 mile race finishes in Nome. Racers have to finish the 350 mile race in a previous year before they can enter the 1000 mile race. In February 2017, Moses Lovstad will be competing in the 1000 mile race on skis. We’ve been building a rather special sleeping bag, that Moses designed using our Design Your Own Sleeping bag system. You can use Moses’ exact bag as a starting point for your own design. Moses is also taking our Omega Down Jacket, Omega Mitts, and a VBL. Good luck to Moses and all the other 81 competitors! The Coupe Aéronautique Gordon Bennett is the oldest and most prestigious event in aviation and the ultimate challenge for the pilots and their equipment. The goal is simple: to fly the furthest non-stop distance from the launch site. The international competition was initiated by adventurer and newspaper tycoon James Gordon Bennett Jr. in 1906, when 16 balloons launched from the Tuileries Gardens in Paris, France. Little did the crowd of 200,000 spectators know that this race was to continue throughout the 20th century. 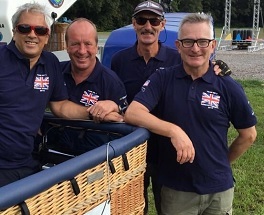 The 2016 race is the 60th, and includes John Rose and Clive Bailey who are representing Great Britain. With the hydrogen-filled balloons getting to altitudes of over 5,000m (18,000 feet), and flying continuously for thousands of kilometres, keeping warm is essential. Team GB are using our Xero Salopettes and Mera Socks. We wish John and Clive the best of luck. GB have only won once, in 2008. The reward for winning? Host next year’s event! Self-confessed “tall and skinny” American, Chase Hinckley, was looking for a down suit in a size that “doesn't exist in the world of mass production”. So he came to us. Accompanying Chase on his attempt on K2 will be his customer-made ‘K Series’ Xero Down suit in 1000 fill-power down. We've sized it to Chase’s requirements, but we've also embroidered his name on the chest. Having tested the suit in Pakistan, Chase says “Wow, just wow. This is way better than anything Batman or Superman puts on. Truly impressed with the engineered finished product". We wish Chase best of luck on K2. 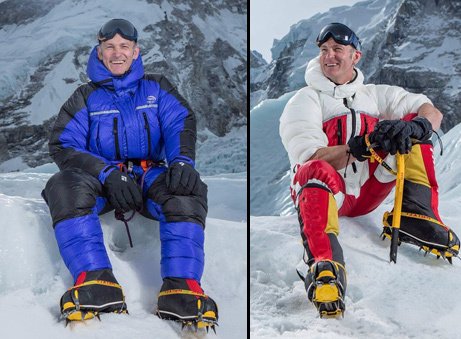 Congratulations to Britons Kenton Cool and Robert Lucas who have become the first foreigners to summit Mount Everest in two years after deadly disasters forced climbers off the mountain. Kenton and Rob were escorted by two local guides, Pemba Bhote and Dorje Gyalzen Sherpa, reaching the summit 08:15 on Thursday. On Wednesday, nine Sherpa guides scaled Everest while fixing ropes for other climbers who plan to climb the mountain this week. 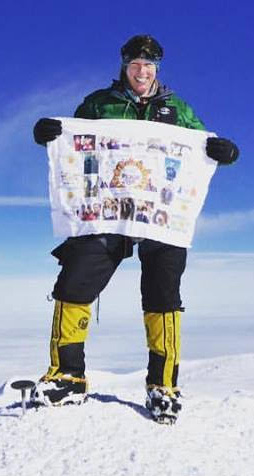 It’s Kenton’s 12th time on top of the world’s highest mountain. 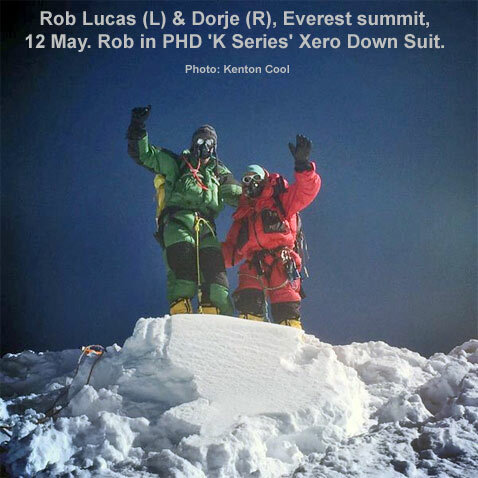 Rob used a PHD 'K Series' Xero Down Suit, a 'K Series' Diamir 1200 Sleeping Bag, Omega Down Mitts, Xero Down Socks, and an Extreme Balaclava. James Clapp departs Swansea in June for what will be his third trip to northern waters on board the doughty Pilot cutter Dolphin. This time he and three companions will be using some anchorages found on a previous trip to provide access to the Lemon mountains for a spot of climbing. James has to keep warm in a completely open cockpit dodging icebergs and brash ice, with fierce wind chill from Katabatic squalls not to mention ‘refreshing’ spray from sea water at between -2°C to +2°C. James is taking our Zeta Jacket with Primaloft Gold insulation, which will work superbly in the cold, damp conditions and is cut for freedom-of-movement when climbing up and working the rig. He’s also taking some of our Kappa Primaloft Mitts, a Kappa Primaloft Vest, and a Minim 400 ‘K Series’ Down Sleeping Bag. Built in 1909, ‘Dolphin’ is one of only 18 remaining Bristol Channel Pilot Cutters, known for being fast, highly manoeuvrable and yet easy to handle by just two crew. Fair winds and following seas James. The Continental Divide Trail (CDT) is the longest, toughest, and most rewarding of the national scenic trails in the US. It runs 3,100 miles from Mexico through the states of New Mexico, Colorado, Wyoming, Idaho, and Montana. The trail is beautiful but is unfinished in many places and requires considerable amounts of cross-country navigation. 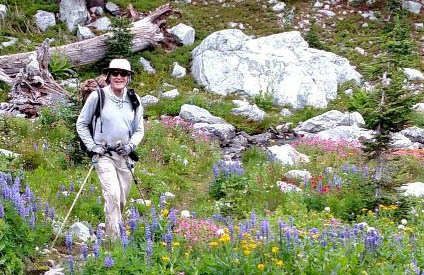 Last summer, Porter Storey started in Mexico and, with the aid of his wife Gail, got to Colorado just as the high country got a late Spring storm that dumped 4 feet of snow. To cover the 20+ miles per day over rough territory in his mid-60’s, Porter only carries 8-9 lbs (3.5-4kg) of gear plus food and water, so snow camping is rough! So he skipped Colorado, and picked up the trail again in Wyoming, making it all the way to Canada. This summer, Porter is hiking the remaining 800 miles of the CDT through Colorado. He is trimming his pack weight even more, to below 8 lbs (base weight) while preparing for cold temperatures at the high elevations of Colorado. Porter says he expects his PHD gear “to allow me to carry less and stay warmer than last year!” Porter is packing a PHD Minim 400 'K Series' Down Sleeping Bag and a WaferLite Down Shirt. Congratulations to the over 970 finishers of the 2016 Marathon Des Sables. We are delighted that over fifty of this year’s competitors were equipped with down sleeping bags and down jackets from our brand-new ‘Marathon des Sables Collection’. Tom Leader, who was the fifth-placed Irish competitor. Like the race itself, our Marathon des Sables collection will be back: look out for it on our website from November 2016 onwards. Update: 6 June 2016: One week ahead of schedule, Paddy and Steph have completed their ski across Greenland's polar Ice Cap from West to East. On the way they raised over £14,000, got engaged, and lost a stone in weight. First completed by Fritjof Nantzen in 1888 (albeit by a different route), the crossing is one of the big three Polar expeditions and reputedly one that has been completed by fewer people than have summited Everest. "We completed the crossing in 24 days - about a week ahead of schedule thanks to some hard graft and more than our fair share of favourable conditions. Our custom made PHD Sleeping Bags and accompanying Vapour Barrier Liners were invaluable in the cold conditions (down to -30°C) inside the tent, while the Omega Jackets performed a similarly impressive job outside. The expedition had a bit of everything - there were days where we felt heroic and others where we came close to crying; some were skied under a bright blue cloudless sky, other days where we could barely see our hand in front of our face. The unseasonably warm weather proved to be something of a double-edged sword - ultimately thawing the glacial lake and melting the sea ice that covered the 11km stretch between the end of the icecap and the small settlement of Isortoq, which housed a heliport and marked our scheduled extraction point. As a result, this ordinarily nondescript 3-hour finale morphed into an entirely separate adventure in its own right. After dumping some non-essential items, we set off from the icecap’s edge in search of Isortoq by any route possible – scrambling up boulder fields with our pulks on our backs, tentatively skiing over sections of thawing ice, and hauling the pulks over snowless rock slabs. Over two exhausting days (covering just 7km as the crow flies) we were picked up by two hunter fishermen who ferried us the remaining 4km to Isortoq. As proud as we are to have completed the crossing, we are more proud to have raised over £14,000 for three amazing charities. We're also pleased to announce that on Day 17 I proposed to Steph, she accepted and we are now engaged." Paddy and Steph took two of our Design-Your-Own Sleeping Bags, which they customised to their own requirements. This is Steph's bag, and this is Paddy's bag. The bags can cope with temperatures as low as -64°C. They also both taking our warmest down jacket, the Omega, and Vapour Barrier Liner (VBL) bags to protect the down insulation in the extreme cold. 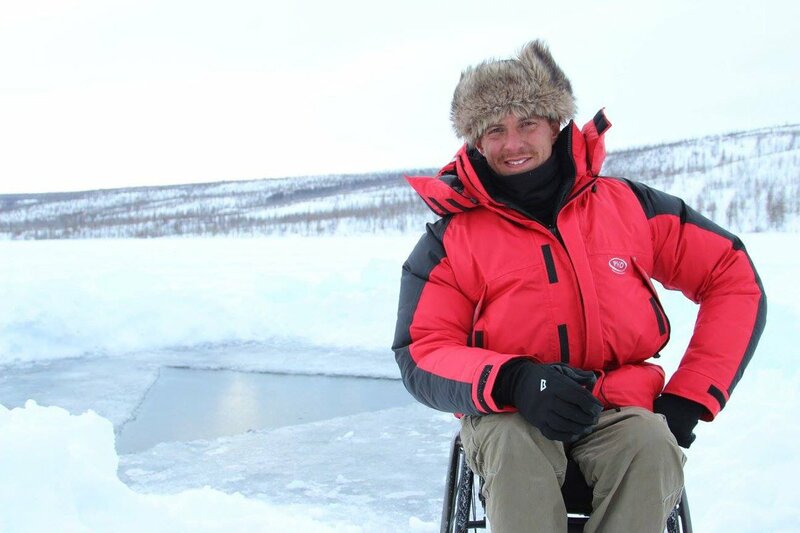 Ex Royal Marine and pilot, Arthur Williams, headed off to Siberia on the Easter Weekend to film an episode of the second series of Channel 4's Flying to the Ends of the Earth. Arthur is a former Royal Marine who was paralysed in an accident several years ago. Despite this he has since learnt to fly. For his Channel 4 series Arthur flies to remote and hard-to-reach places across the globe, only reachable by plane, meeting the extraordinary people who live there. For Episode 3 of the 2nd series, Arthur is flying to Siberia. Arthur has taken a full complement of PHD kit to protect him, including an Omega Jacket, Omega Salopettes, Omega Socks, Omega Mitts, and an Extreme Balaclava. Update 1 August 2016: The Siberia episode is now available to watch online until the end of August. It's a dramatic start to the series: a dangerous helicopter crash leaves Arthur facing a long drive on ice roads. Arthur says "it was terrifying. I was in shock for a good couple of hours after it happened. I think everybody was. It's the most isolated I’ve been anywhere in the world and when it’s minus 25 degrees – which it was – and the helicopter is the only means of getting out of there quickly, it becomes a big deal". Fortunately Arthur was well protected byPHD gear. Even at -25C he has "never been so toasty". You can follow Arthur on Twitter, or via his website. Everest: Third time lucky for Thirsk pair? David & Chris Bradley are a father and son team from the UK who are attempting Everest together this year. David had two unsuccessful trips in 2014 and 2015, but is returning again this year for what he says will be his final attempt. They are taking PHD Xero Jackets and Salopettes, Diamir 1200 Sleeping Bags, and Rondoy 'K Series' Jackets. You can follow their progress at their website. Update 20 May 2016: Congratulations to Chris (pictured right) who summited Everest with Tim Mosedale and Sherpas Jabbu and Ptemba! Tim writes that summit day “was dark and bitterly cold but they saw the sun rise and glimpsed the shadow of Everest being cast way off in to the distance”. Coincidently, another PHD client, Jo Bradshaw (pictured below), summited just 15 minutes before Chris. 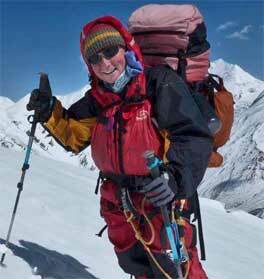 Jo joins a select group of only 35 British women to have climbed to 29,029 feet. Jo too says the temperatures were "baltic" but she was "glad she made the extra investment in the top of the range PHD Omega Down Suit. Thanks for keeping me from freezing!" Update 6 May 2016: We wish David a speedy recovery. 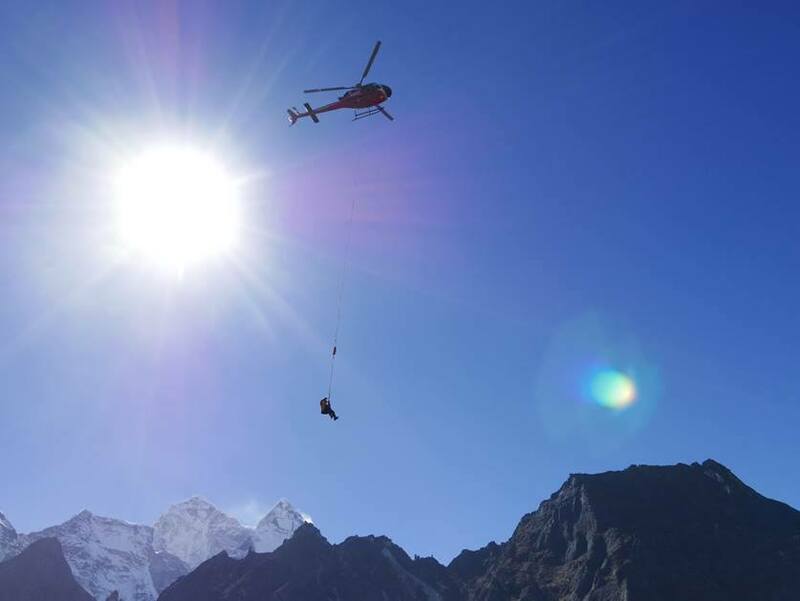 He is currently in hospital in Kathmandu after being evacuated by helicopter from Everest base camp with a pulmonary embolism. David seems in good spirits and continues to update his blog. Indeed he says his whole story from evacuation to final diagnosis has been filmed by the Discovery Channel! Son Chris is still on the mountain and, according to David, "going strong". This January Conrad and Hilary Dickinson began their journey across Norway, end to end. Their plan was to travel the entire 2,700km length of the country, in winter, in 120 days. Both are experienced in Polar expeditions and have traversed Greenland (unsupported) and skied to the South Pole and kite skied back (unsupported) amongst other trips. Conrad and Hilary have taken our Hispar 600 K sleeping bags, Yukon K Jackets, Wafer trousers and Wafer socks with them on their journey. After Hilary recently suffered an injury, both Hilary and Conrad made the tough decision to end the trip and return home to the UK. Luckily at the last minute their good friend Ian Jackson decided to step in and join Conrad with the aim of completing the journey." Find out more about the ‘Norge på langs’ route, their expedition, and follow progress on their website. This year Anna set off from Bluff, New Zealand to run 1,911 miles along the Te Araroa trail. Alone, unsupported and with all her gear in a 14kg backpack, she scampered through forests, over mountain ranges, across rivers and along beaches – taking 148 days to travel from the Southern-most point of the South Island, to Cape Reigna in the very North. 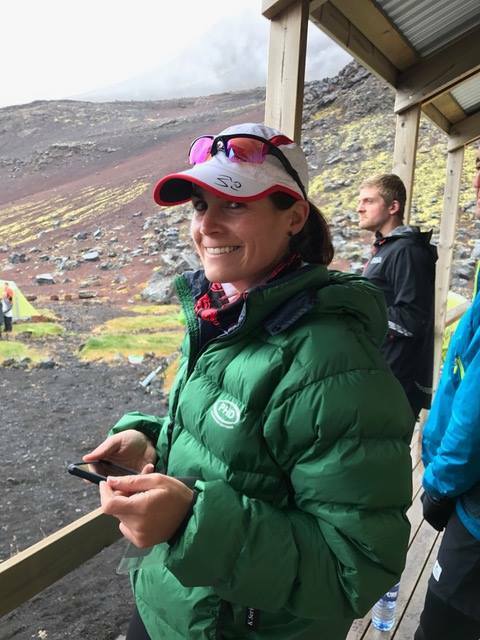 On the way Anna visited schools and community groups – speaking to over 4,000 kiwi kids about adventure and the great outdoors, and raising funds to send youngsters on adventures of their very own. Weight was crucial in choosing her gear, so Anna took a Minim 400 'K' Down Sleeping bag and PHD Wafer down socks. You can follow Anna’s further adventures on her blog. As the highest placed British female ever in the Marathon des Sables, Jo Meek has ultra-marathon form. 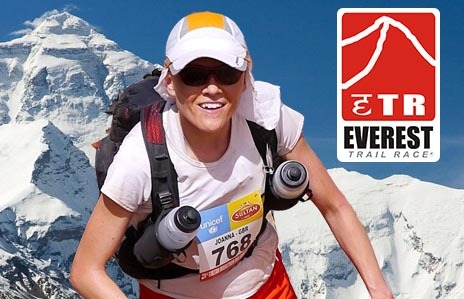 This month Jo is running the Everest Trail Race: 153 kms in 6 days. Ok, you might say, easy enough. But what about the lack of oxygen, carrying kit for temperatures of -10°C and lower, and more than 25,000 meters of vertical ascent and descent! After six months off due to injury Jo has had to train hard for this event, including putting in the hours on the treadmill using a simulated altitude machine to mimic running at 2500+m. We wish Jo the best of luck on the race and hope all her sacrifices, including selling her VW Camper van :-(, are worth it. Update 19 November: Jo was the second fastest woman, and fourth overall. Well done Jo! ​25-1-2016. Our sincerest commiserations to Henry’s family on the news that Henry died after suffering exhaustion and dehydration during the final stages of his expedition. Henry Worsley is attempting the first unsupported and unassisted solo crossing of the Antarctic landmass. On this epic journey of 1100 miles – from Gould Bay to the Ross Ice Shelf via the South Pole – Henry will make the first solo descent of the Shackleton Glacier. Hauling the food, fuel and equipment he needs for this test of endurance, Henry aims to complete the crossing in 75 days. For the journey Henry is using a PHD Hispar 600 ‘K Series’ sleeping bag and ‘K Series’ Xero Down Jacket. This is Henry’s third expedition to Antarctica. 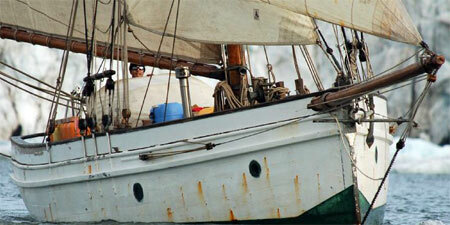 In 2008/09, he led an expedition to commemorate the centenary of Shackleton’s 1907/09 ‘Nimrod’ journey. The journey – comprised of descendants of the original party – retraced the original route, arriving at Shackleton’s Furthest South exactly 100 years to the day, before completing the journey to the Pole. To commemorate the centenary of Captain Scott’s and Roald Amundsen’s expeditions, Henry returned to Antarctica 2011/12, leading a team of six soldiers in a race along the original 1912 routes to be first to the South Pole. 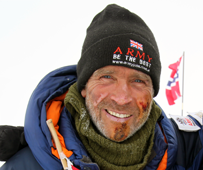 On this expedition Henry will be pulling a sledge containing his food, tent and equipment and he will not receive supply drops or help across the ice from dogs. Chiz Dakin is an outdoors photographer and author who contributes regularly to Cicerone Press as well as TGO and Trail magazines. 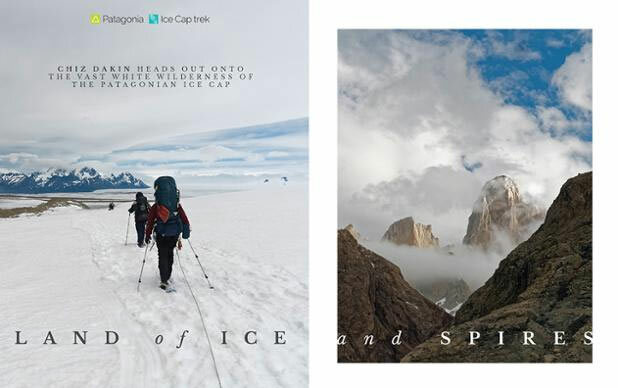 In November 2015’s TGO Magazine, Chiz describes her expedition onto the Patagonia ice cap to seek out its centre at Paso del Cuatro Glaciares. This included taking a PHD Hispar 500 Down Sleeping Bag, which, at less than 1kg, was “half the bulk of her normal winter bag”. Chiz found it to be “one of the best of her kit upgrades” with bag's lofting ability “extremely impressive” and an “unbeatable warmth-to-weight ratio”. Cycle courier and explorer, Emily Chappell, spent this last winter riding 3,600km unsupported through Alaska, Yukon and British Columbia. In this video we catch up with Emily 20 days into her trip in Whitehorse, Yukon. Encountering temperatures down to -40°C, Emily used two PHD down sleeping bags (Hispar 600 and Hispar Overbag) in combination. Using two bags rather than one made packing her panniers easier, and gave her three temperature options (-6°C, -21°C and -45°C) rather than one. Previously Emily cycled across Asia, from Wales to Japan, not to mention crossing Iceland by bike too. Her first book, about life as a London cycle courier, will be published by Guardian Faber in 2016. 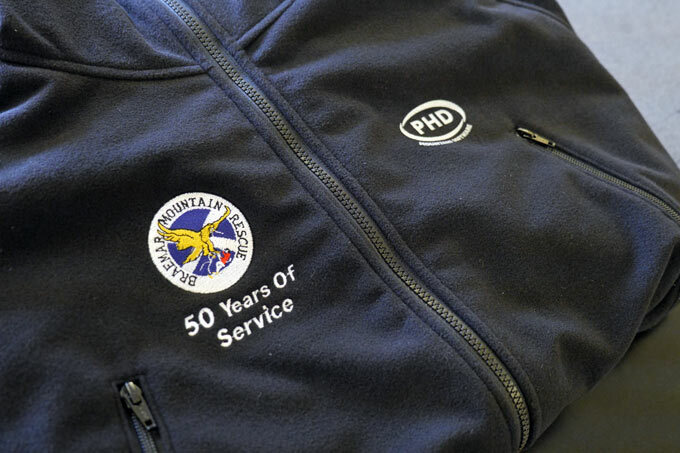 The Braemar Mountain Rescue team is 50 years old this untain Rescue Team. Since 1965 they have been turning out to incidents in the Cairngorm mountains, assisting the lost or injured and also, sadly, sometimes recovering bodies. These volunteers not only give up their time to help on a shout, they also maintain equipment, raise funds and of course train in the mountain and first aid skills needed to be able to help mountaineers and walkers in trouble. It’s an amazing commitment to those of us who enjoy the mountains. Right now we’re making the Team a set of our Taiga Fleece Mountain Jackets. We know they’ll be put to good work. Congratulations on 50 years of service and we wish the team good luck in the next 50. Ed Stafford made his name as the first person to walk the length of the river Amazon, an incredible feat that took more than 2 years. Ed's new series for Into the Unknown, starts 27th August 2015 on Discovery Channel. In it Ed visits West Papua, Siberia, Ethiopia, Brazil, and Zambia; exploring some of the most remote and inaccessible places on the planet. For his expedition to the Danakil Desert in Ethiopia (episode 3) Ed packed one of our Minim Ultra Down Sleeping Bags. Watch that episode to find out how Ed coped after s a camel carrying all of his precious water gave him the slip. Link Sar has been, in his own words, a “bit of an obsession” for Jon Griffith. 2015 was Jon’s fourth attempt on this 6,938m unclimbed peak in the Charakusa Valley, Pakistan. Andy’s been bitten by the bug too – returning this year for a second time. The expedition attempted the Northwest Face, leaving base camp on 12th July and making their first bivvy at 6,100m. Snow conditions and Jon suffering with a high-temperature meant it wasn’t until 17th July they reached the Western summit. Their choice of name for this new route: ‘Fever Pitch’ of course. Back in a cold and damp May this year, Claire Maxted and Sarah Ryan of Trail Running Magazine ran part of the Knoydart section of the Cape Wrath Trail as a recce of the new Cape Wrath Ultra, which will take place for the first time in May 2016. The Cape Wrath Ultra takes place over 8 days covering 400km with over 12,000m of ascent. The race starts at Fort William and finishes at Cape Wrath at the North Western tip of Scotland. Half the race is on rocky trails; a quarter over mud, streams, and boulder fields; and the rest over completely un-trailed terrain. The longest day is a punishing 64km and the toughest is (day 4) around Beinn Eighe to Kinlochewe. The Cape Wrath Ultra has a bag drop system for overnight kit but if, like Claire and Sarah, you want to recce the route you’ll need to carry a tent and sleeping bag. Both Claire and Sarah went with a ‘sleep system’ approach of combining two PHD sleeping bags, one inside the other.